Come see the Land of Waterfalls, Pisgah National Forest Cabin Rental. Waterfalls, we can tell you where all the best ones are when you stay with us! My daughter climibing up a waterfall to slide back down again! Horseback riding in the Blue Ridge Mountains through the river! My husband and daughter plunging into a waterfall! 26 Tunnels on The Blue Ridge Parkway, this one is on the edge of the mountain. My daughter in front of a massive waterfall, picture doesn’t do it justice! 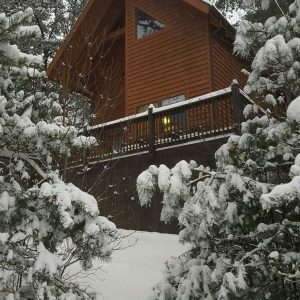 Our cabin at the start of snow fall, we sit high up on the ridge on the side of a mountain! Come cool off with us and catch snowflakes on your tongue! My daughter taking the THRILL down the HILL …snow tubing! The road to our cabin after a fresh snowfall!! So pretty! Come ski, snow tube, snow board or snow shoe with us! Mt. Mitchell on The Blue Ridge Parkway. Highest point east of the Mississippi River! With the evening temperatures in the 60s, the hot tub is relaxing after a busy day! My daughters on a hike off The Blue Ridge Parkway, what a work out! Through the river! Just $35/person, let us help plan your itinerary at no extra charge! We know all the best places! Linn Cove Viaduct, the most complext concrete bridge in the world, goes around Grandfather Mountain 1243 feet without touching it…amazing! My daughter on a hike. The Blue Ridge Parkway is a hiker’s paradise! Our own dogs, on the Blue Ridge Parkway enjoying the cool mountain air! Horseback riding through the river! Spring,Summer and Fall! Horseback riding through the river in the mountains! This gallery shows just a few of our favorites, there are so many more! Come see us in the Land of Waterfalls, Pisgah National Forest! My husband and daughter taking the plunge! Can’t you just feel the cool mountain air? This is a fun one to plunge into! Another favorite spot of ours! Hiking trail on the Blue Ridge Parkway,complete with a stairway to heaven! Not surprised if it was a dream! June 2016 The cabin, and Jill the owner, are gems! A Great 8 nights with my family! Loved your recommendations in the welcome packet! Romantic Get-a-Way, enjoyed the seclusion! Cozy cabin that exceeded our expectations!